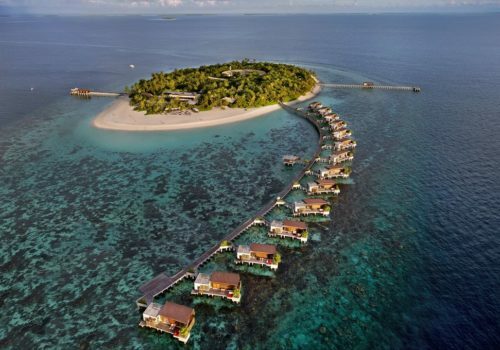 Park Hyatt Maldives Hadahaa oozes the luxury of a 5-star resort in the Maldives. Located in North Huvadhoo, one of the largest natural atolls in the world, this retreat is a haven with natural white beach, azure lagoon and a 360° house reef steps away from each villa. Revel in your choice of 50 private villas, nestled within the natural landscape or perched over the water with sweeping ocean vistas, each designed with the utmost comfort in mind. Enjoy the native history, be welcomed into a local home, fish in tropical waters aboard a Dhoni, or dive into turquoise waters to explore the world of untouched coral reefs. Feel at home in this 300 sq m villa fitted with a king size bed and a private outdoor terrazzo bathtub and rain shower area. Also includes a second bedroom at 44 sq m, fitted with two single beds and a separate bathroom. The villa features large pool with semi-submerged sun beds, outdoor bale/cabana. Unwind in this 115 sq m water villa with 180° views of the ocean, features a king bed, indoor bathtub, sun deck with daybed and direct access to the house reef. Relax in a 265 sq m villa featuring a large pool with semi-submerged sun beds, outdoor bale/cabana, a king size bed and a private outdoor terrazzo bathtub and rain shower area. The 180 sq m villas are fitted with a king bed, chaise lounge overlooking a private plunge pool and deck, indoor and outdoor shower area with terrazzo bathtub and rain shower area with direct beach access. The 165 sq m villas features a king bed with chaise lounge, private deck with table and chairs, sunbeds, indoor and outdoor shower area with terrazzo bathtub and rain shower area with direct beach access. This 5-star hotel is famous for its 360° reef. It prides itself on individually tailor making each guest’s experience during their stay. You can fish, kayak, spot dolphins, cross the Equator, cruise into the sunset, relax in the spa, learn how the Maldives was formed or cook a Maldivian feast. It’s your Maldives holiday, so it’s up to you how much or little you want to do but above all, unwind and enjoy your time. This contemporary à la carte dining restaurant serves breakfast, lunch and dinner featuring a range of international cuisine for unique dining experiences in Maldives. A traditional grill combined with a wood fired oven complements the open kitchen décor where guests can watch chefs at work. Perched directly over the lagoon overlooking the Indian Ocean horizon, The Drift is a dining experience redefined with an exclusive seating. With views of the resort, pool and beach, our bar in Maldives offers a broad selection of signature refreshments from around the globe. This traditional yet contemporary lounge area is a true architectural masterpiece for Maldives resorts. Select from a list of unique and romantic dining venues and enjoy one of the best Maldives dining experiences with your loved one. Serving an extensive all-day menu from both The Dining Room and The Island Grill, our in-villa dining service caters on request.